Marelle Taylor Stampin' Up! Demonstrator Sydney Australia: Only 2 Days Left to Sale-a-Brate! Only 2 Days Left to Sale-a-Brate! This would have to be one of my favourite layouts to use on a card....and it works for almost any stamp set. Pop your image inside a large circle, and pop your sentiment on a banner (I use the hexagon punch to make the 'v' for my banner). Choose a co-ordinating piece of Designer Series Paper, and a piece of ribbon, and you are done. Easy Peasy! 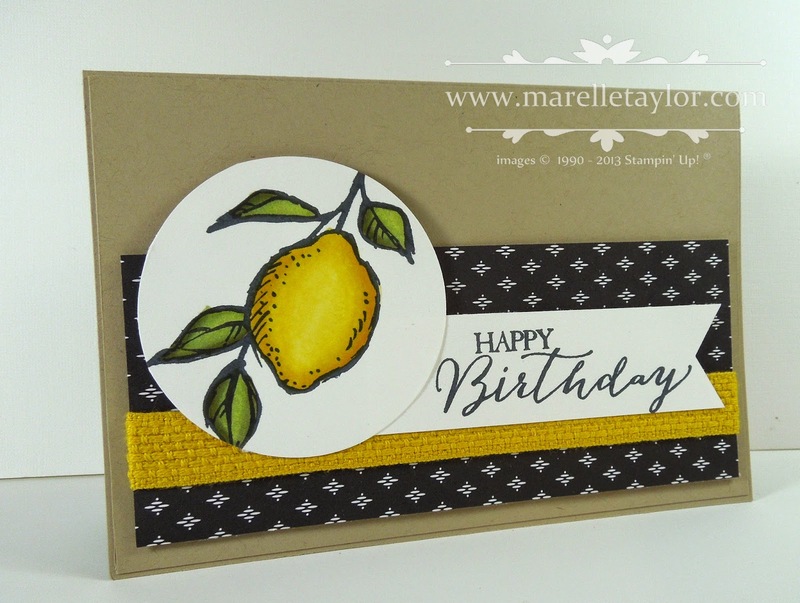 This pretty lemon is from one of the Sale-a-Bration stamp sets, so it is available until the 31st March and then gone forever....that's TOMORROW!